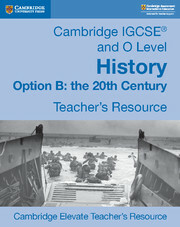 Help your students take an enquiry-led approach to historical learning with Cambridge IGCSE® and O Level History. Full of activities and primary and secondary sources, this resource encourages the application of historical skills and enables investigative questioning of cause and consequence. Endorsed by Cambridge Assessment International Education for Option B, the coursebook is written by a team of experienced teachers and provides comprehensive coverage of all of the Key Questions and four of the Depth Studies for syllabus Option B: the 20th Century. Sample answers to a selection of the exam-style questions can be found in the teacher's resource. Also provides ideal support for those studying history pre-AICE. 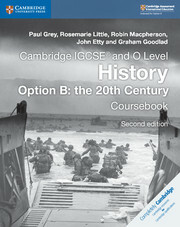 Written by a team of experienced teachers to cover Option B: the 20th Century, for first examination from 2020.